The desert will make anything seem small. Consequently, I think we have a hard time grasping the enormity of the destruction solar and wind companies are proposing when they choose to bulldoze intact ecosystems instead of building on already-disturbed lands or investing in distributed generation. If you walk across a Mojave Desert valley and find a nice perch on one of the surrounding mountains, you'll overlook a vast expanse of creosote bushes, blackbrush, yucca, and Joshua Trees. The ecosystem may look harsh, but it is teeming with life -- desert tortoises, bobcat, burrowing owls, bighorn sheep, horned lizards, sidewinder snakes, and kangaroo rats, bees, and specialized moths. When energy companies show up, they see that expanse of nature as a bank account. The more they build on it, the more money they can put in their pockets. So when First Solar announced plans to build in the Ivanpah Valley of the northeastern Mojave Desert, it was obvious they had no appreciation for the fragile ecosystem, and simply saw a desert valley that could earn them money. There are plenty of areas throughout Nevada and California with already-disturbed lands, and there are millions of empty rooftops waiting for solar panels. But First Solar is ignoring these alternatives, and its two Ivanpah Valley projects -- Stateline and Silver State -- will permanently shut down a wildlife corridor, kill dozens of threatened desert tortoises, and imperil rare desert plant life. The images below show the size of the proposed First Solar projects relative to familiar places. At the very bottom of this post is a map of the Ivanpah Valley depicting the actual locations of the proposed solar projects. 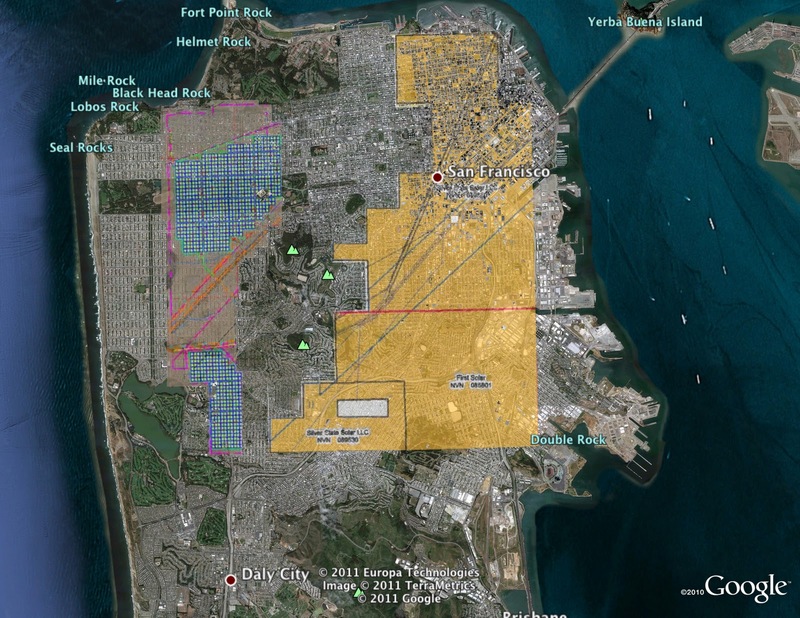 (Click on image to expand) This Google Earth image shows the outlines for the Stateline solar (left) and Silver State solar projects (right) relative to the city of San Francisco. 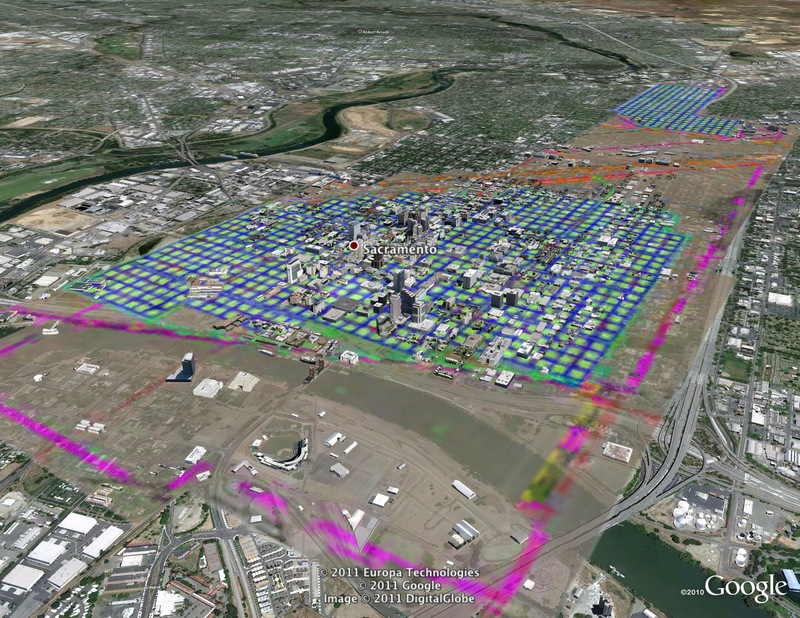 (Click on image to expand) This 3D Google Earth image shows the outline of the proposed Silver State solar project right-of-way relative to downtown San Francisco. 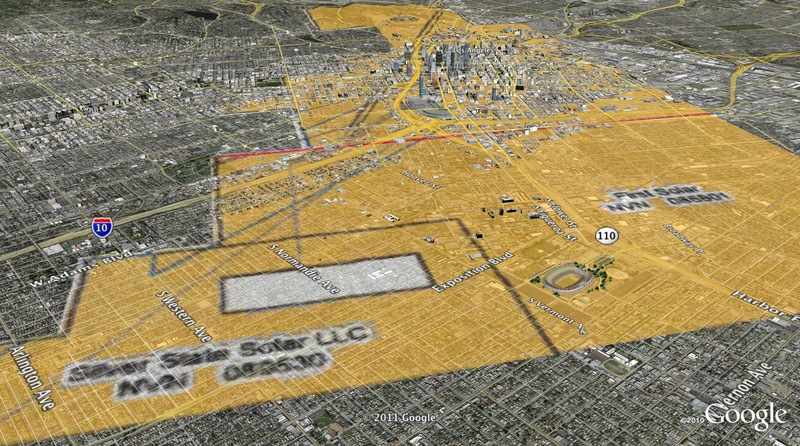 (Click on image to expand) This 3D Google Earth image shows the outlines of First Solar Inc's proposed Silver State solar project right-of-way transposed over the city of Los Angeles, That's the LA Memorial Coliseum in the forefront, the skyscrapers of downtown LA further in the background, and way back in the hills is Dodger Stadium. First Solar's project would destroy and fragment desert habitat of this proportion in the Ivanpah Valley of the northeastern Mojave Desert. Now let's compare the energy generating potential of our cities and the solar facilities in the middle of the desert. First Solar's Silver State solar project would generate approximately 340 MW, according to the Bureau of Land Management website. The footprint of the project relative to downtown Los Angeles is depicted in the image above. According to a UCLA study, however, the city of Los Angeles has the potential to generate up to 5,500 MW of solar energy by placing panels on rooftops. 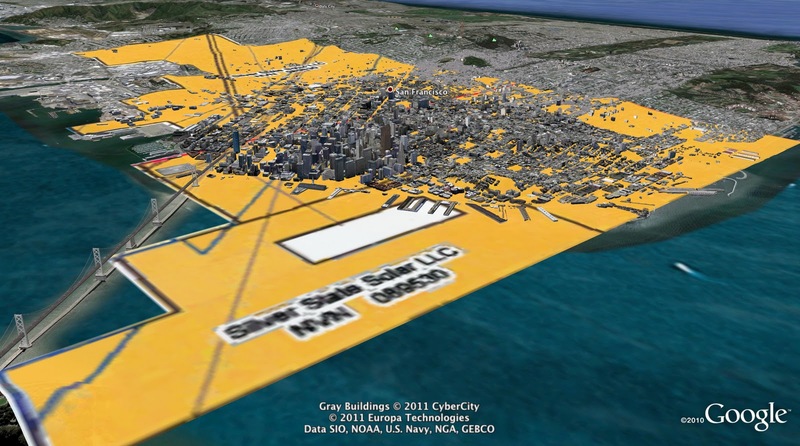 The County of Los Angeles has even more rooftop solar potential -- 19,000 MW. That rooftop alternative -- a form of "distributed generation" -- makes destructive projects like Silver State unnecessary. An outline of First Solar's Stateline solar power project relative to downtown Sacramento. The project would blanket nearly 3.4 square miles of prime desert tortoise habitat in the Ivanpah Valley with photovoltaic (PV) panels. 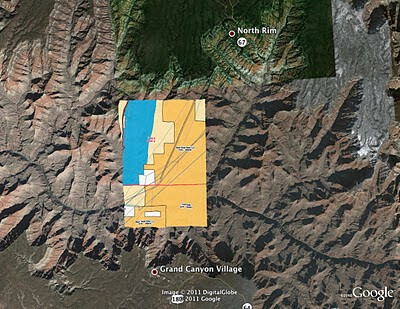 (Click on image to expand) If First Solar's Silver State solar power project were put in the Grand Canyon, it would fill almost the entire vista from the Grand Canyon village on the South Rim, all the way to the North Rim. (Click on image to expand) This Google Earth image shows the Ivanpah Valley in the northeastern Mojave Desert. The white outline on the far left is the Ivanpah Solar Electric Generating System (ISEGS), which is already under construction. 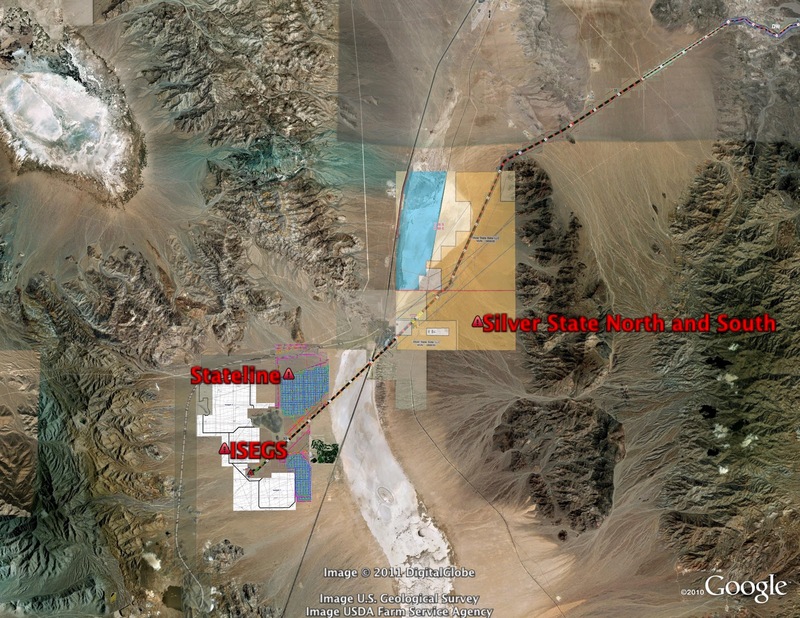 The other two are First Solar Inc's Stateline and Silver State projects (center, and upper right). 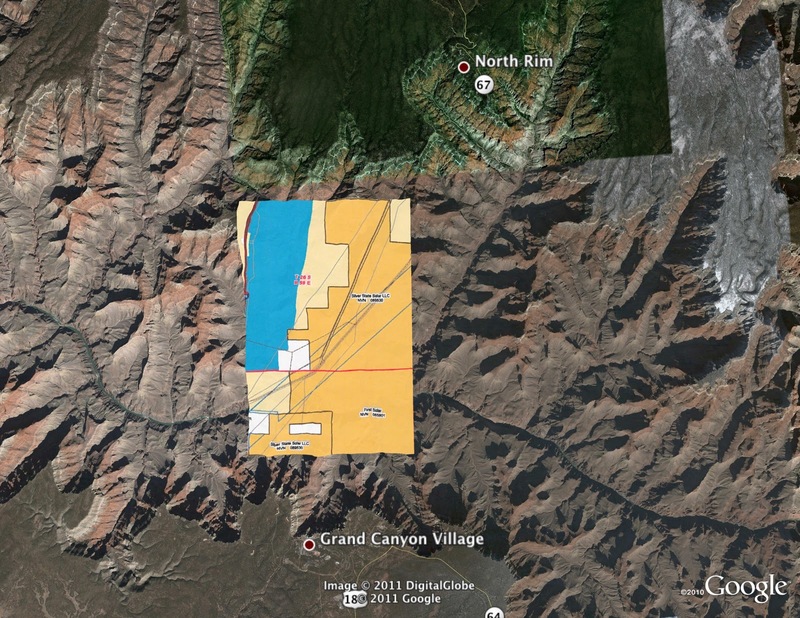 All three projects will have enormous cumulative impacts on the desert ecosystem.